It’s December, which means New Yorkers of all ages are all trying to catch a glimpse of… no, not Santa’s sleigh, silly. We’re talking about an even more fabled means of transportation. The New York Transit Museum’s vintage trains and buses have officially hit the roads and rails. 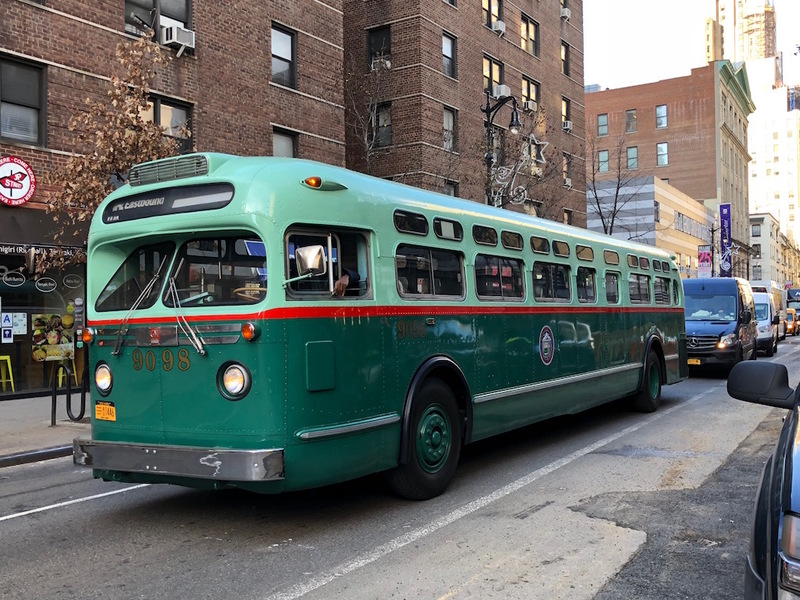 We saw bus #9098, a General Motors model from 1958, rolling down East 8th Street this morning, and others will be cruising around town this month. Among the vintage buses that will be traveling along 42nd Street and parked at both Union and Herald Squares will be a Fifth Avenue Coach Lines prototype from 1956, one of the nation’s first air-conditioned transit buses; a couple of midcentury buses with bubble-shaped “Fishbowl” windshields, used from the late 50s to the early 80s; and a GM 5303 that was built in 1966, rebuilt in 1984, and used till 1990. This week until Dec. 21, the buses will be out and about on weekdays from 9am to 5pm. The trains, meanwhile, have been running since Thanksgiving weekend, and will continue running through Dec. 30. You can catch a 1930s R1-9, aka the “Holiday Shopper’s Special,” departing from the 2nd Avenue F stop at 10am, noon, 2pm, and 4pm on Sundays only. It’ll make stops at Broadway–Lafayette Street/Bleecker Street, West 4th Street–Washington Square, and various uptown stops all the way up to 125th Street. Please realize that these buses hail from a pre-wifi era and plan your Insta uploads accordingly.